One of the advantages of ignorance is that sometimes you are charmed by the unexpected - which was what we felt when we encountered so many Art Nouveau buildings in Helsinki. As architecture and design fans perhaps we should have known that the city has so many Art Nouveau structures, but our ignorance fueled our delight as we walked around. How fabulous to find so much so we didn't expect to find! 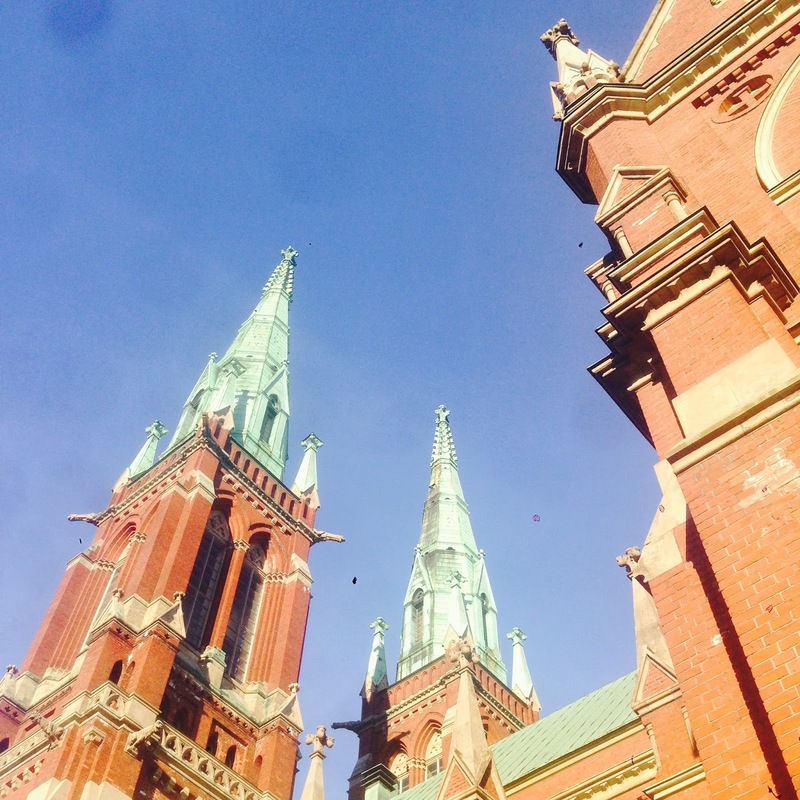 Helsinki isn't a city with an immediate appeal. Yes, it's nicely situated right on the water but it's a relatively modern city without the charm of a medieval center. Founder by the King of Sweden as a rival trading post to Tallin, Helsinki was a relative backwater for several centuries only becoming the Finnish capital in 1812. The city suffered a devastating fire in1808 and subsequently the center was entirely redesigned in a modern Europeans style with squares and large boulevards in the Nineteenth century. 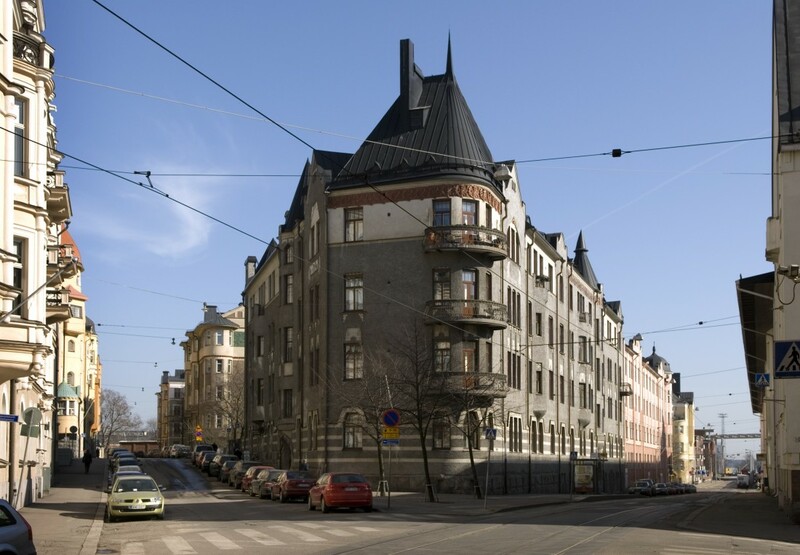 Consequently, no buildings in Helsinki are more than two hundred years old and the city has many structures from an expansionist period at the turn of the Twentieth Century when older wooden buildings were replaced with multistory Art Nouveau stone construction. Years ago we took a walking tour in Buenos Aires looking at Art Nouveau architecture in a downtown neighborhood. It was fascinating because the city attracted migrants from all over Europe and they brought their favored architectural styles with them. It's a wonderful places to see the variety of these styles next to each other; those favored by the French (Art Nouveau), the Germans (Jugendstil) and the Italians (Stile Floreale or Liberty) as well was additional associated styles including the British Arts and Crafts and the Secessionists. It was in Buenos Aires that I really came to understand the diversity of European Art Nouveau designs and how they varied enormously from the elaborate floral curvature to simpler more restrained design. 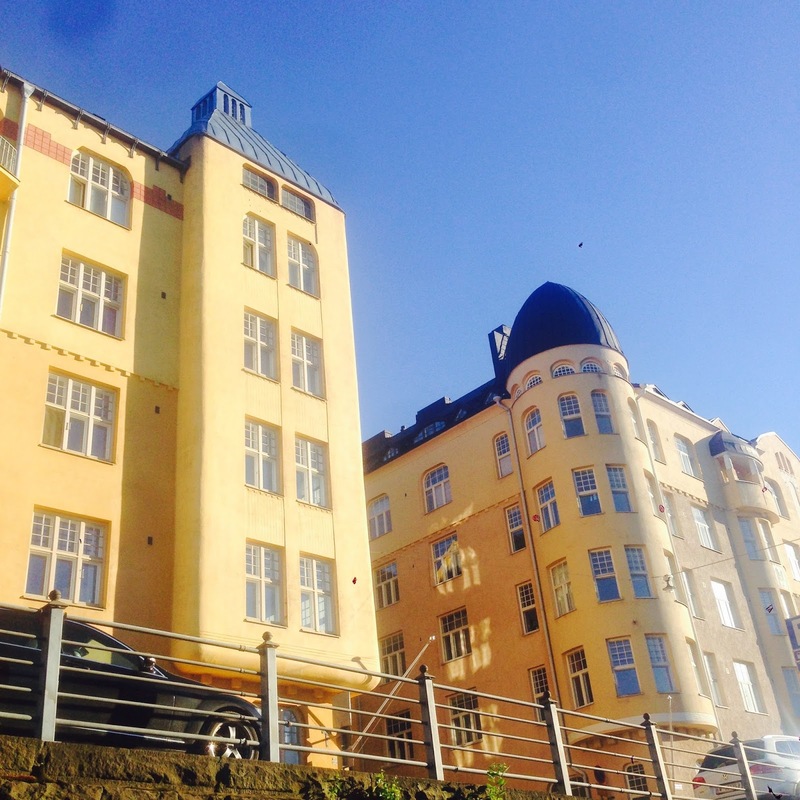 In Helsinki the buildings seemed to have an austere, masculine and restrained Jugendstil aesthetic. There is an emphasis on stone facades with historical revival elements, but as you can see above, contrasting styles can found right next to each other. The Art Nouveau European Route (which has been put together by municipalities and non-profits who aim to to promote and preserve Europe's Art Nouveau heritage) includes this helpful description on Finnish Art Nouveau. "In Finland, Art Nouveau found a special expression in the National Romantic Style, which was perceived as fundamentally Finnish, despite its international influences. The rough granite façade thus became a symbol for Finnishness, and the fortress-like shapes were seen to be filled with references to Finland's medieval history. Nordic legends and nature were a rich source of inspiration for decorative subjects. The most striking examples of this style are the Pohjola building, the National Theatre and the National Museum." The Helsinki Central Train Station photographed at the top and above, is a magnificent building with an extraordinarily impressive facade. Here you can see a distinctive aesthetic form that conveys a sense of the monumental, of solidity and restrain with influences from both Arts and Crafts and the Successionist movement. Designed by Eliel Saarinen (father of the famous designer and architect Eero Saarinen) between 1911-1914, there's something very masculine, classical and constrained about the decorative figures. They appear to be mythical gatekeepers and they project a sense of guarding the space as they hold forth the lights. Saarinen was known for his "National Romantic" style and though this building was redesigned to bring in a more modern look. Throughout Europe you can see how the architecture of the period was closely linked to Nationalist movements promoting local cultural traditions and knowledge, self reliance, political independence and linguistic expression in the indigenous languages, including Finnish, Czech or Catalan instead of Swedish, German or Spanish. Once you start looking up there are interesting architectural details everywhere. We also saw buildings in an earlier neo-gothic tradition including this church. 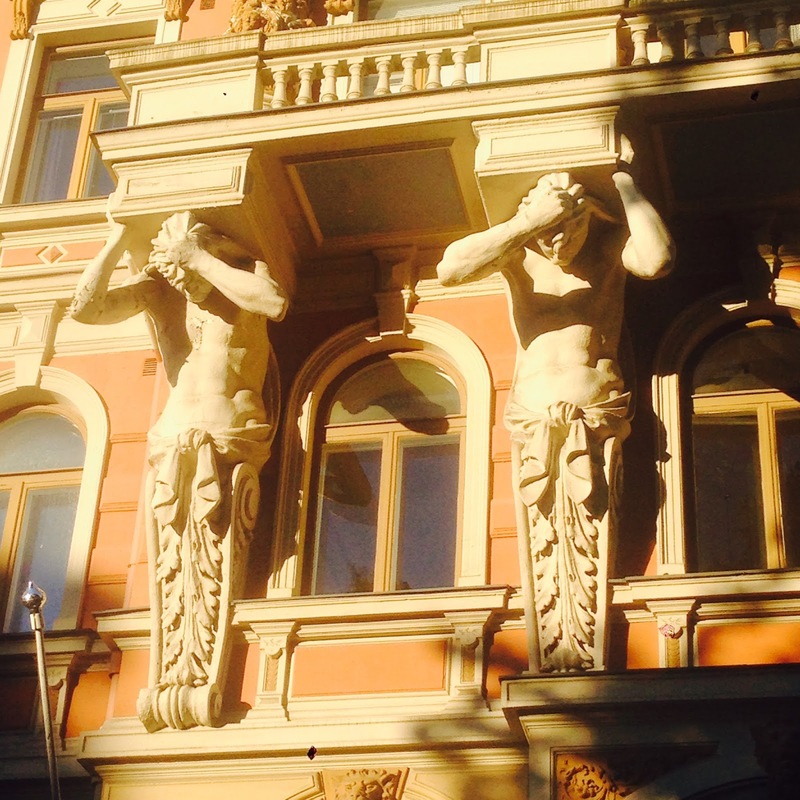 I particularly loved these Caryatid who seem almost overwhelmed with the weight of the building. In addition to the downtown area and the design district there were quite a number of interesting buildings in the nearby Katajanokka area which features street after street of buildings constructed during this period. 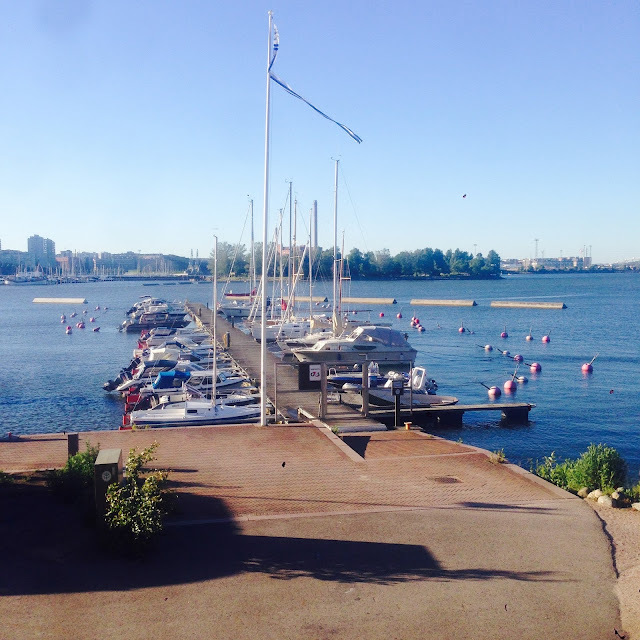 Like so much of Helsinki the neighborhood is very close to the water. There is plenty of interesting architecture and design in Helsinki whether you're looking at Modernist, Art Nouveau or Gothic Revival buildings -see the Design Museum below. However, it's a city that so many Art Nouveau buildings that it's very much worth visiting for those who are interested in the architecture and national politics of this period. If you liked this you might like my post on the Courtauld's Art Deco Palace at Eltham outside London or this post on Finnish Art Nouveau. 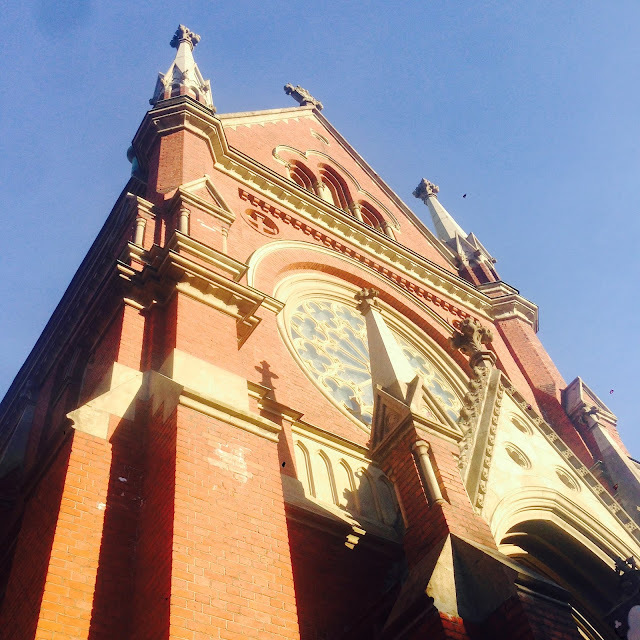 Thanks for a great blog post about our beautiful Art Nouveau style city! You're right, most of the buildings are from the 19th and 20th century, but there are still some (though very few) buildings which are more than 200 years old - the oldest one just in the corner of the Senate Square, called the Sederholm House, from 1757. I hope you got to see also our beaufiful wooden buildings for example in Wooden Vallila area. If not, welcome to enjoy Helsinki soon again! There is so much to see also outside the immediate city center. Thanks for your comment Liisa and all the additional information. There is indeed plenty to see in Helsinki and we very much enjoyed getting out of the center of town. We spent five nights in your lovely city and will certainly be back. Great, please let us know when you're coming! Day With A Local Helsinki will host both private and public tours next year.